For most of us, personal data has been increasing at a rapid rate and while cloud services have popped up to help keep all that data synced, nothing really beats keeping a copy of your own data close at hand. With USB 3.0 and its higher bandwidth now becoming more and more mainstream, it’s now far easier to move all that data around. 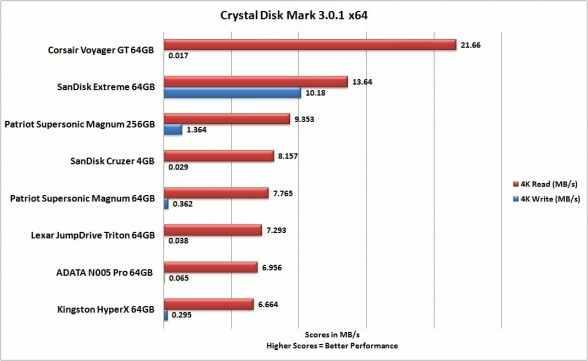 A couple months ago, we did quite an extensive roundup of the top 64GB USB 3.0 flash drives on the market and while 64GB seems like a lot especially in comparison to what was available only a couple years ago, it’s quite paltry these days, when trying to back up video, pictures, or even a digital game library. 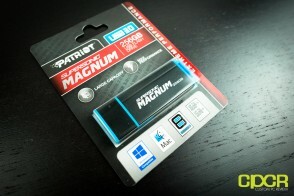 Today we’ll be reviewing the Patriot Supersonic Magnum 256GB flash drive. In terms of appearance, the Supersonic Magnum is aesthetically identical to the 64GB edition of the Supersonic Magnum reviewed previously; however, Patriot is is bumping the performance rating on the 256GB Supersonic Magnum up to 250MB/s reads and 160 MB/s writes. 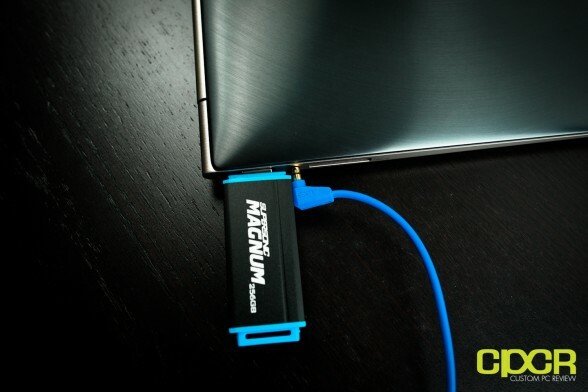 While the 256GB Supersonic Magnum is still using a single USB 3.0 controller and 8 channels of flash memory, the higher density of the memory allows greater performance in comparison to the lower flash density in the 64GB edition of the drive. 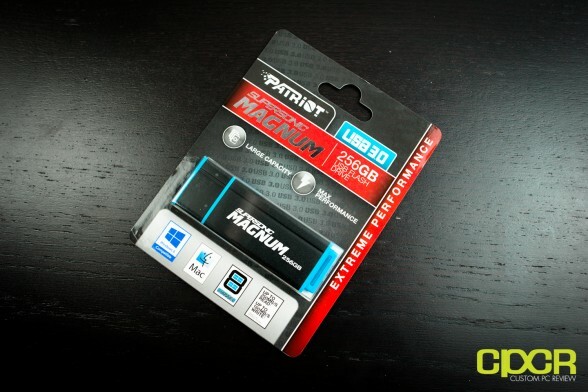 Let’s take a look at the packaging for the Patriot Supersonic Magnum 256GB. The flash drive supports both PC and Mac, and utilizes 8 channel technology which boosts transfer performance up to 250 MB/s sequential reads and 160 MB/s sequential writes via USB 3.0. Here’s a look at the rear of the packaging. The drive features a 5 year warranty, which will pretty much last the useful life of the drive. 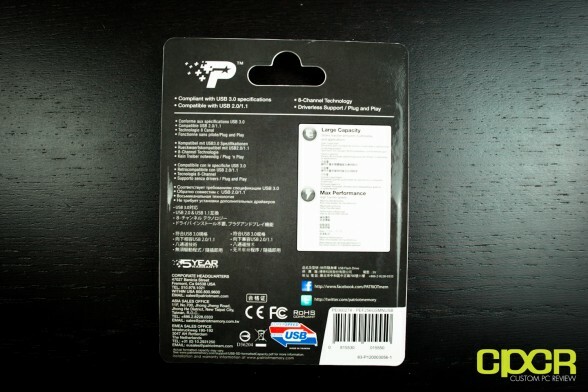 Breaking open the packaging, we can see that Patriot has gone with pretty much no accessories on this one. All we’re getting is a very simple, very elegant aluminum/plastic cased flash drive. Removing the top cap, we can see the USB connector inside. The nice thing about the cap design is that while the cap is on, the USB connector is fully protected. The downside of course is that the cap tends to get lost quite easily. For those without a lanyard connected to the back of the drive, the cap can be installed here. 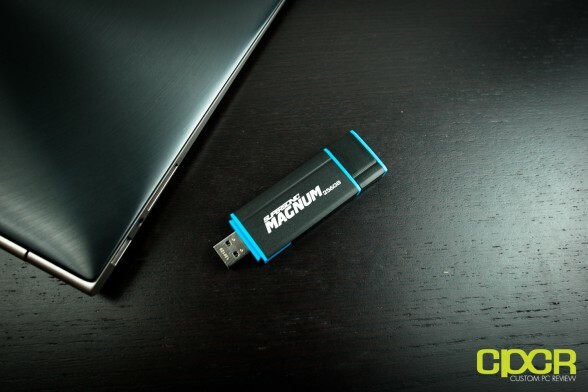 Taking a look at the sequential read/write performance, we can see that the Supersonic Magnum 256GB is capable of 266.7 MB/s sequential reads and 173.7 MB/s sequential writes. It’s always nice seeing that a product is capable of outperforming its rated specifications as the drive is rated at 250 MB/s sequential reads and 160 MB/s sequential writes. 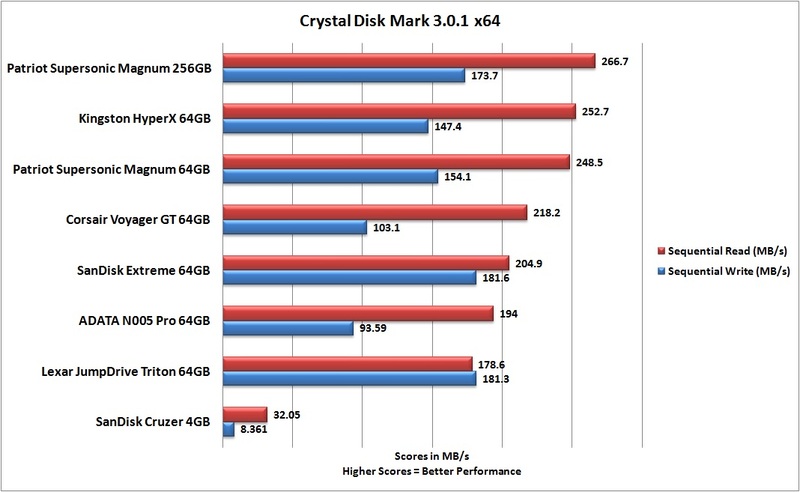 Also notice that the Patriot Supersonic Magnum 256GB tops our charts here with the fastest sequential read performance and it’s among the fastest in terms of sequential write performance as well. The higher density flash memory likely gives the Supersonic Magnum 256GB the performance advantage over 64GB flash drives, including the smaller capacity Supersonic Magnum 64GB. Moving onto 4K figures, the Patriot Supersonic Magnum 256GB is definitely among the better performers, but falls short of the SanDisk Extreme 64GB in terms of 4K writes. 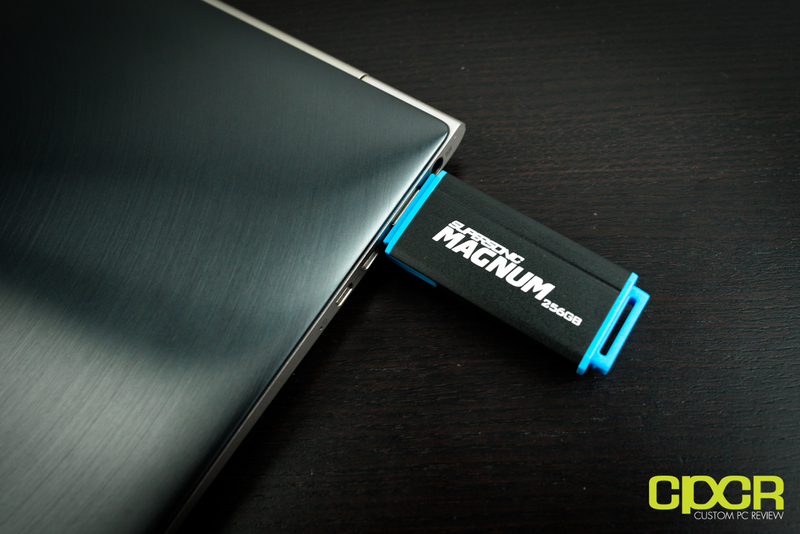 The Supersonic Magnum is definitely more geared towards storing larger data files rather than smaller files. Alright so with that, let’s talk about the Patriot Supersonic Magnum 256GB. 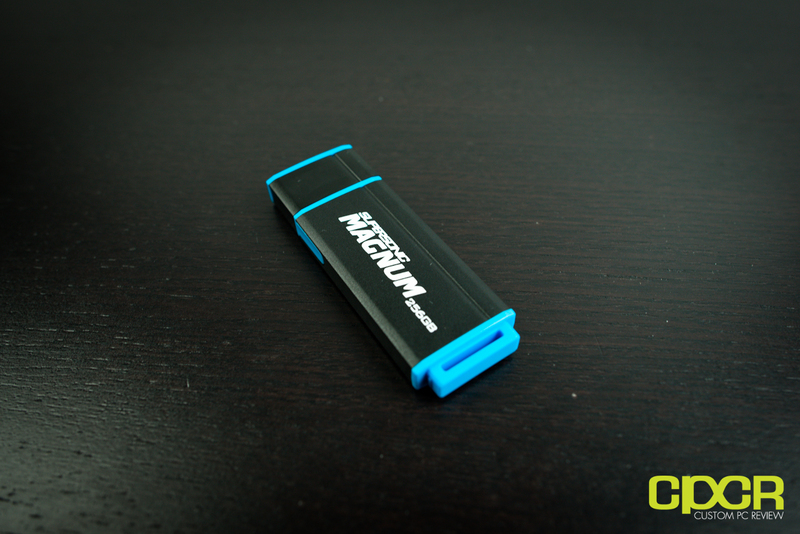 Performance is fantastic as expected and the sequential read/write performance tops the performance on every flash drive we’ve tested to date. This is because the 256GB Supersonic Magnum has denser flash memory onboard which as we’ve seen time and time again from SSDs, generally tend to perform better. What’s most important though is that this drive is going to perform very well for transferring large data files. As far as aesthetics and design, it’s really the same drive we saw with the Supersonic Magnum 64GB. The main concern with the drive is just the fact that it’s quite wide, which could pose a problem for those with USB ports that are very close to each other. Of course, the only other design option here is to make the drive taller rather than wider, but then that also creates the issue of the drive not fitting with stacked USB ports. There’s always a give and take here I guess. As far as pricing goes, the Patriot Supersonic Magnum 256GB is currently available for $294.68 ($1.15/GB), which is definitely expensive for a flash drive, but given the fact that it’s such a niche item, I think it’s still reasonable. It also comes with a 5 year warranty, which is quite long and should last the lifetime of the drive, but a number of top tier flash drive manufacturers have incorporated a full on lifetime warranty to their flash drives, which is something I’d like to see from Patriot as well. 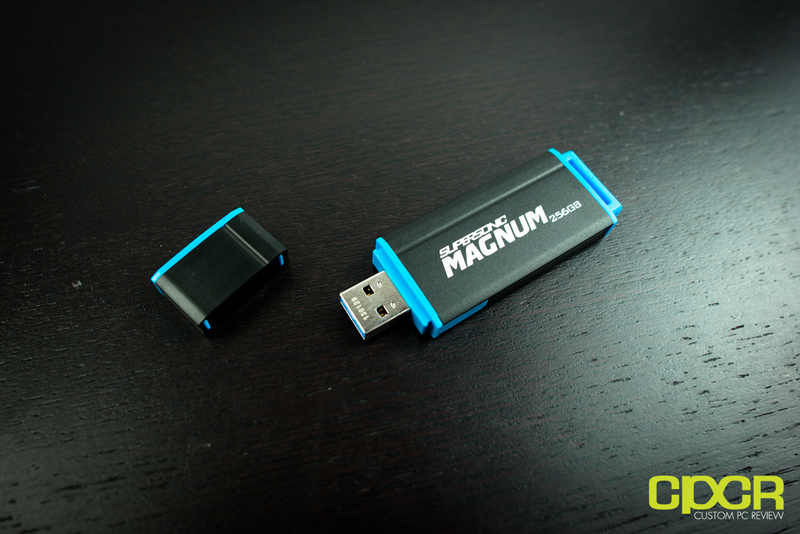 With the general audience, I think most people should be able to get by with a 64GB or less flash drive, but those who need the extra capacity from something like the 256GB Supersonic Magnum should definitely expect to pay the extra. 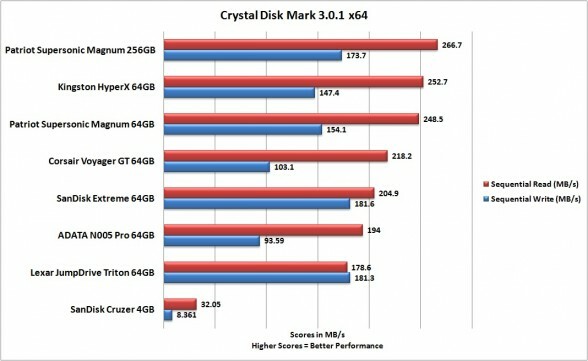 As for competitors, there really aren’t many out there with the capacity offered, but Kingston does have the HyperX 256GB ($399.38) as well as the even larger capacity HyperX Predator 512GB ($841.73); however, both drives are significantly more expensive per gigabyte than the 256GB Supersonic Magnum.